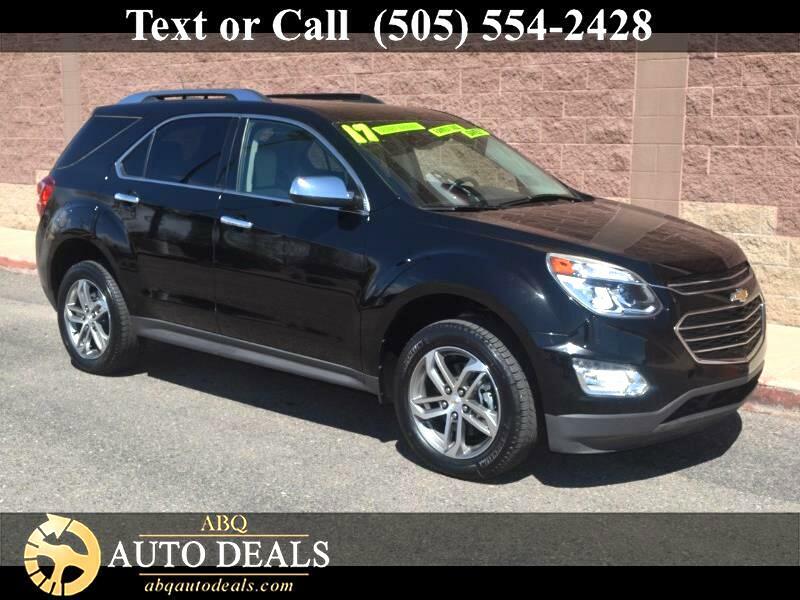 Sleek, safe, and stylish with a wealth of amenities, our One Owner, Accident Free Black 2017 Chevrolet Equinox Premier AWD SUV is going to check off all the boxes on your list! The muscular 3.6 Liter V6 offers 301hp while tied to a responsive 6 Speed Automatic transmission that sends you down the road with ease. This All Wheel Drive team allows this nimble five-passenger vehicle to score near 24mpg on the open road with ample get-up-and-go while providing a confident and capable ride. Check out our exterior to see this Equinox Premier has beautiful lines enhanced by fog lamps, chrome accents, roof rails, and beautiful alloy wheels. Slide inside our Premier, and you'll feel instantly at ease and perpetually indulged with loads of legroom for optimal comfort. You will appreciate a leather-wrapped steering wheel with mounted controls, an auto-dimming rearview mirror, automatic climate control, and power-adjustable heated leather front seats with driver memory. Stay connected thanks to Chevrolet MyLink touchscreen interface with voice controls, Bluetooth, smartphone integration, available Navigation, and a great Pioneer sound system with available SiriusXM radio. Our Chevrolet Equinox has received excellent safety scores and demonstrates a commitment to excellence with a steel safety cage, anti-lock disc brakes, a rear view camera, adaptive cruise control with collision warning, lane departure alert, and StabiliTrak to help you stay grounded in all sorts of road and weather conditions. You'll also have the peace of mind of the available OnStar automatic crash response. A practically perfect blend of efficiency, utility, space, and style, this Equinox might be the best decision you'll make this year! Print this page and call us Now... We Know You Will Enjoy Your Test Drive Towards Ownership! Your buying experience with ABQ Auto Deals is our number one priority.